PNR, day 18: drink red wine, or write love songs? When in the Napa Valley, it helps to have some connections. 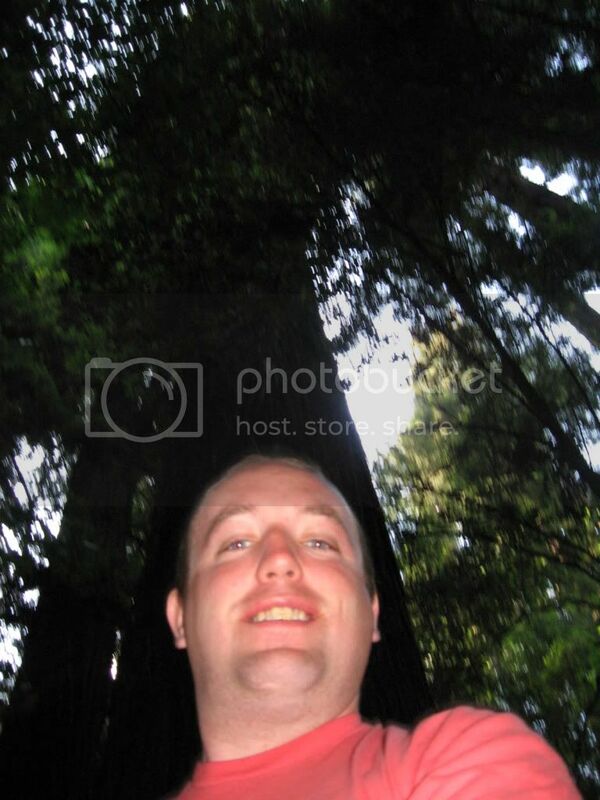 The redwoods are tall. Me: not so much. The second half of the Post-Navy Roadtrip began with a hurried frenzy. I rolled back over the first time I woke up, and when I came to again, it was 10:48. That meant only twelve minutes to pack everything up and check out. I got it done with two to spare, and was quickly away. On this day, I didn't manage fuel economy particularly well, and thus had to pit in Sausalito - and pay $3.30 per gallon. The next stop was at a Wendy's in Petaluma. I noted some young girls dancing and preening, and for some reason, I decided then and there that I wouldn't ever want to endure the people of California as a resident, and so posted on Facebook. I made a detour off the 101 into the Napa Valley, to Clos Pegase Winery in Calistoga. Why only this one location? Because one of my high school classmates is a winemaker there. He was on the property, and I benefited greatly from this. I got a personal tour of the place, free tastings of three wines, and half off the bottle I bought. My intent is to share that bottle with some good friends back in Northport soon after this trip concludes - hopefully, the wine survives that long. I made a few stops at Leggett. I needed gas again; this time it was $3.31/gallon, so I only took enough to reach Eureka. I also took a picture of the sign marking the end of California Route 1, and then I had to pee. So I went to a place advertising a bathroom - the Chandelier Tree. For just five American dollars, I got to relieve myself...and drive my car through a sequoia tree. No injuries or damage were suffered. I briefly detoured off the 101 and headed down the Avenue of the Giants, where I took some pictures among the tall redwoods. It was 7 p.m. when the Blue Trooper reached the edge of Humboldt Bay - I'd finally made Eureka, the home turf of Sara Bareilles. If you read this thing regularly, you know I tend to gush about her and her music a bit. 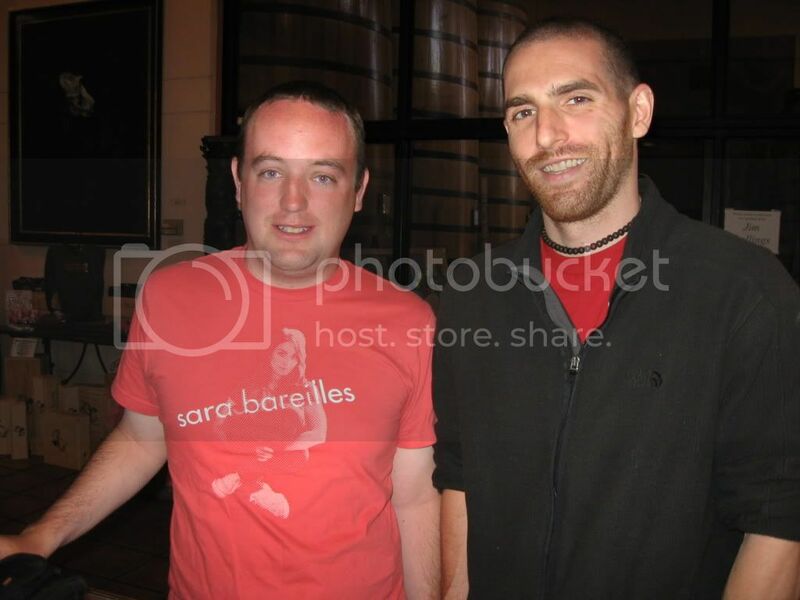 As luck had it, I was wearing my melon-colored Sara B shirt that I bought at the show in Hartford. Actually it wasn't luck...it simply happened to be the last clean shirt I had. I made straight for the Lost Coast Brewery. I greatly enjoyed this latest chapter of "America by Brewery." Watching the Pittsburgh Penguins close out the final game of the Stanley Cup Final made it even better. After dinner, I checked into the Super 8, and was dismayed to discover that the internal climate control seemed to be non-functional. The only way to take the temperature of the room below 78 °F was to open the sliding door, which allowed in noise from the street. I wondered whether to go out - it was, after all, Friday night. The relative tameness of Eureka, combined with the distance of the motel from the bars, meant that I'd stay in. I wanted to get to sleep early, as I knew I'd have a lot of driving the next day, but as it usually does, my nocturnal nature reigned. At least I got to see something on The Tonight Show with Conan O'Brien that would be most helpful later in the trip.